Film has a power to incorporate a number of different mediums. Nowhere is this more true than with music and I thought I’d write a list of some of my personal favourite musical moments. I decided to pick films that were non-musical and where the performance takes place within the narrative. I also wanted to focus on indie movies that you may not have seen. Let me know if there are any films I missed. Here they are then and I’ve tried to pick some films that I think are worth watching too. Starring Elizabeth Olson and John Hawkes, this powerful film details the difficulties in escaping from a cult. The plot follows Martha, a battered young woman attempting to start her life again after a number of years of physical and psychological abuse. There’s a haunting performance somewhere around the mid point from a grizzled Patrick (John Hawkes). He sings Marcy’s Song a lovely old folk song written by Jackson C. Frank. The moment shows the seductive power of his character. Unfortunately I couldn’t find a clip from the film so you’ll have to make do with this one until you watch the movie. This little indie from San Francisco focuses on the underground music scene there and the protagonist is an unhappy musician. This set up is simple enough but the strength of the film is its reliance on musical performances to articulate the emotional place the character is coming from. I’m Not a Hipster is a film that a lot of people missed but I’d recommend looking it up. Jim James sings in I’m Not There. It’s an unusual film and it tells the story of Bob Dylan through several different actors including Cate Blanchett. Each one represents a different time in Dylan’s life. Never a person to seek definition, I’m Not There artistically represents Dylan and Jim James does a good turn too. This is a film populated by familiar faces from Dustin Hoffman, Maggie Gyllenhaal, and Emma Thompson to Will Ferrell. Marc Foster directs the film and there’s lots going for it. The story follows Harold Crick (Ferrell) an IRS auditor who starts hearing a voice narrating his life. The setup is funny, the casting good, and Will Ferrell manages to squeeze in a Wreckless Eric cover. A film from Sophia Coppola starring Bill Murray and Scarlett Johansson, it tells the story of a mid life crisis set in Tokyo. There’s a noisy karaoke scene and Bill Murray plays Bob Harris whose sombre outlook is reflected in his downbeat choice of song. Richard Linklater’s Before Sunset is the mid point in his trilogy about Jesse and Celine’s relationship. Not much is said about Celine’s perspective on their romance until she opens up and sings Jesse this song. This is the third part in Gus Van Sant’s trilogy about death. Last Days is about a musician called Blake (Michael Pitt) who is roughly modeled on Kurt Cobain. The narrative follows Blake, just released from rehab as he mumbles and wanders around a big old empty house. We all know how the story ends but a touching performance from Pitt serves to humanise Blake and provide a brief moment of respite. The Sound of My Voice is another film about a cult and it involves a leader (Brit Marling) who believes she has time traveled from the future. When asked to sing a song from her time this is what she sings. It’s a Cranberries song from the nineties called Dreams. This slight documentary explores the lives of a number of parking lot attendants. Most of them are young and many over educated but they’ve opted to work a fairly menial job. It’s an interesting movie, if slightly vacant, and there’s a gentle acoustic performance that contributes to this documentary being a slightly idealised portrayal of their working life. The recent Coen Brother’s film is perhaps better known than many on this list. It does however manage to capture the singer songwriter movement in the sixties well. Oscar Isaac stars as struggling, egotistical musician Lleywn Davis. However there’s a song in the film that Llewyn isn’t invited to sing on. That task is left to Carey Mulligan and Justin Timberlake. Good Vibrations is set in the tumultuous 1970s of Ireland’s Belfast. In the mix of sectarian violence and battle lines being drawn sits Terri Hooley; a man who wants to open a record shop and a music label. Hooley discovers that punk rock has made its way to Belfast and it seems that music can say some of the things that he hasn’t been able to. Steve McQueen’s film Shame is about New Yorker Brandon (Michael Fassbender) who shuns human connection in favour of sexual gratification. When his sister moves in (played by Carey Mulligan) his carefully constructed world is challenged. 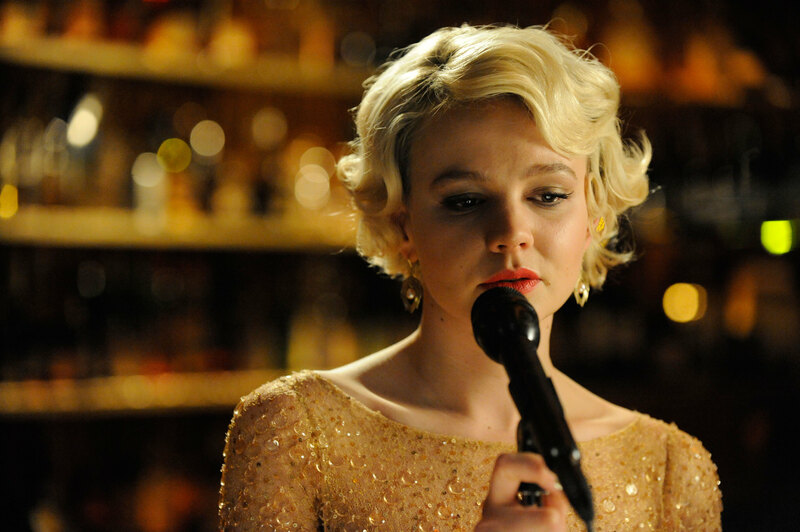 Carey Mulligan sings New York, New York in Shame and her gentle voice belies the tone of the rest of the film. I’m sure I’ll think of more in the future, but for now that’s all. There are plenty of good films on this list so explore further and let me know of any that I’ve missed.